A blind tiger was an important source of revenue for some boats. 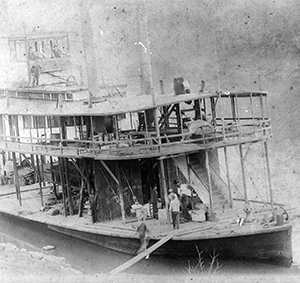 An organization would reserve the vessel, hire a string band, pack food and drink if the steamer could not supply it and set off. Dancing was enjoyed in the saloon, while courting couples walked around the upper deck while being watched by an ever-present chaperon. There were also instances when an all-male group commissioned a boat for what amounted to a floating stag party. One of these parties was witnessed by 12 boys who hid on board. The boys later recalled the laughter, ribald shouts, songs and speeches that grew louder as the day progressed, and they thought it wise that the captain had strung ropes all around the lower deck to keep his increasingly unsteady passengers from falling overboard. When the wild and jolly trip came to an end, the stowaways remembered what fun it was to see the drunks hauled up the muddy river banks. If a church made the charter, however, the band and dancing, the ribald shouts, songs and speeches and – naturally – the drinking were dispensed with. Almost everything else, including the food, the courting couples and chaperons, was much the same. Each summer for many years, the Centre Methodist Sunday School booked The Dixie for a day trip on the Coosa River to the spring at Davis Landing at Pollards Bend, where church members enjoyed picnics, all very proper and quite dry. Some river men on the Coosa were aware that prohibition did little to stop the thirst of the drinkers. They refused to accept the law’s limitations, and blind tigers soon began to appear on the river. Often converted steamboats, these floating bars and dance halls became legendary. The boats would tie up near bridges or ferry crossings to maximize their contact with the public and then open their doors to the thirsty. If authorities tried to close down them, the boats simply cast off the lines and moved to another location. Some felt safer anchoring midstream, where the arm of the law could not reach. What was best tor the proprietor, however, was not always best for his customers. After an evening at a blind tiger, many customers found it harder to row back to shore than it had been to row out to the boat. Accidents on the return trip were frequent, and the occasional drowning provided an instructive example of the wages of sin for Sunday’s sermon. Some blind tigers stayed for so long in the same place that they became a landmark for travelers and a problem for local residents. Prohibition might have been the law of the land, but accommodating the public was the rule of the river. Just above Gadsden was the community of Rock Run and the home of Bell Tree Smith, a fantastic character who flourished in Cherokee County back in the 1890s and who met the fate of almost all bullies who respected no law and the rights of no man. Smith got his nickname from the fact that he operated a blind tiger under a tree near his place of business. His illicit liquor sales were out in the open air to be seen by any officer or citizen who dared to take the risk of pee-ping or spying, for it was generally understood or believed that monkeying with what Bell Tree Smith considered his inalienable rights spelled sudden death or at least a good pistol whipping, and such like punishment as would call for silence on the part of the unduly nosey. The man’s real name was William (Bill) Smith. In early manhood, he thought he saw a way to get rich by selling moonshine whiskey in a prohibition county and that supported several iron furnaces, particularly around Bluffton, which once had a population of 8,000 and which today is nothing but a weed patch. According to stories published about him and legends that still linger around his old stomping grounds, Smith had a novel idea about conducting a blind tiger out in the open air. He chained a bell to a large tree. Customers came to the tree, deposited the exact sum of money for the amount of whiskey wanted on a projecting shelf or in the hollow of the tree, rang the bell and walked off to a point where he could not see the tree or the bell or the person who delivered the liquor. In fact, the customer knew that it was fatal not to get out of sight. Pretty soon the bell would ring and he would go back to find the amount of white lightning he had paid for. The customer quickly left the neighborhood with-out knowing who sold him the whiskey. In fact, he never saw a single person during the transaction; consequently, the customer could not truthfully swear in court that he had bought his liquor from any certain person. That was the reason that William (Bill) Smith got the nickname of “Bell Tree” Smith. Many people believed that he was really named Bell Tree from the start. It was almost a foolproof system, especially since Smith had the reputation of being a very dangerous man. It was generally known that it would not be healthy for any person to swear against him. When the grand jury met and then the circuit court began its annual grind, Bell Tree was around to see who might be inclined to betray him or swear against him. Bell Tree had killed a man, according to reports, and it was not safe to report him to the law. He was reputed to be overbearing, and almost everybody in that section of the Cherokee County and just across the state line in Georgia was afraid of him. Bell Tree was a bully in his own backyard, which chiefly was located in the environs of Bluffton. It is said that he never raised any rows outside of his own community, where he was looked upon as a sort of hero and almost worshiped by his customers, who were called his “witnesses” by many because he could prove almost anything in court by them. One day Bell Tree drifted into the Borden-Wheeler Springs community, where a large crowd gathered. Always a showoff, Smith decided to give the crowd a sample of his dare deviltry. He pulled out his pistol and ordered a 17-year old boy named Chandler to get down on his hands and knees and eat grass like a cow. Terrified of Smith’s reputation, the boy obeyed. As he ate grass, the crowd, or most of it, was convulsed with merriment. Suddenly, the 19-year old Chandler brother pushed forward. As soon as he realized what was going on, he stooped down, seized a rock and threw it with all his might. The rock struck Smith in the head, knocking him to the ground unconscious. As he fell, his gun fell out of his hand, and 19-year old Chandler picked up the pistol and fired a bullet through Smith’s head. Bell Tree Smith was killed instantly. The older Chandler brother was not bothered by a law agency since he was considered to have acted in his own self-defense as well as in the defense of his younger brother.